CTS pots are fitted as standard to most top end guitars on the market, with Fender® and Gibson® using them almost exclusively in various guises, with PRS®, ESP® and Gretsch® using them on most their higher end models. They're pretty easy to identify really - they almost always have a brass threaded collar (9.5mm in diameter), with a 24 spline (teeth), brass "turning post" where you'll afix the knob (assuming that it is, indeed, a split shaft knob - if you find a completely smooth brass turning post, then its likely to still be a CTS pot, but the solid shaft varient), and usually, any pot made by CTS will usually have CTS stamped somewhere on the base. Taper - Modern Audio vs. Vintage Audio vs. Linear? Taper is simply a technical term for how a pot moves from 1-10, or from 0-100%, depending on how you think of it. Different tapers have different roles within the guitar, and in most cases, they’re interchangeable to give varying results. The difference between modern and Vintage is pretty simple really. Vintage pots are at 20% of their total resistance at 5 on the dial, whilst a modern pot is at 15%. Probably the easiest way to explain the whys and what for’s, is to break down the pots into real life situations you’ll find in your guitar. As a volume control, you’ll mostly find linear pots on Import guitars. In this case, a true representation of output lends itself really well to bedroom playing. It’s purely aimed at a target market looking to keep the guitar quiet and controllable, hitting low volumes during practise. They also turn up fairly often on bass guitars with 2 pickups, but no switching – giving the player a fairly easy to follow blending system. You’ll mostly find logarithmic pots on higher end instruments acting as the volume – in these cases the guitar is obviously targeted at gigging musicians. The guitars never going to be played quiet for extended periods so a log pot actually gives a nice “sweep” at the top end which lends itself to moving through different volumes whilst playing (moving from 10 to 8 on the dial will pretty much half the volume). This gives a great effect when used in combination with true amp overdrive. Obviously if you play on 10 constantly, it’s not going to make much difference; the arguments only really start when you’re changing volume. The main point to take into consideration is that the human ear works on a logarithmic scale. So whilst moving through volumes during playing, it pays to try to match the way the ear works. The problems start when you consider that our hearing is far superior to anything electrical, so the “curve” of a log pots output never really matches up perfectly, so although the sweep feels more natural, it’s still not perfect. Speaking personally, I try not to think of the curve as matching our hearing, instead I think of it as a “sensitive” control that allows better control at high volumes through less movement. The downfall of this “theory” is that it flags up the log pots main cause of concern. Most of the numbers on the dial (1-6) only give access to a very low output. This leads us back to the way the ear works – you can hear a pin drop just as well as you can hear a jet engine, the ear should be able to pick out the lower volume sound the same way it picks the higher volume, and your brain should tell you it’s quieter. On the back of this – the linear pot seems the natural solution, but as with most things, it just isn’t that simple. Although the linear pot is great for low volume playing, and it’s easy to see where you are etc – they sweep in a way that isn’t conducive to human hearing. It sounds like its jumps from one setting to the next, and the ear finds it rather unnatural. Fortunately, “sweeping” from low volume to high volume still sounds perfectly fine on a log pot, but moving around at low volumes is still something that’s never been quite perfected as yet. Luckily, it’s not something most of us do. In closing on the volume topic – if you like making use of volume control whilst playing, then logarithmic control is probably your best bet thanks to the more natural curve of the output, but if you’re looking for a straight forward control solution at set volumes, where dial position represents the output, then linear pots are a great solution. The tone pot on most guitars is a fairly neglected control nowadays sadly. The tone of any given pickup at anything less than 9 seems somewhat muddy and woolly, so more often than not the tone pot is stuck on 10 and left there. In our experience, most complaints with pots come purely from the control that the stock tone pot is offering to the player. The reason seems to be that most tone pots (contrary to popular belief oddly) in any production guitar will in fact be a Logarithmic taper. This will make it behave exactly the same as the volume control (at least to our ears). As we discovered earlier, a Log pot will have most of its control at the higher end of its sweep – which works absolutely fine for volume control – however, with a tone control, when you’re making a “selection” – it leaves a little to be desired, purely because each setting is not equal to the ear. Some people are absolutely fine with this setup, and will use the tone pot to make minute tweaks in the higher numbers. An alternative would be to use a linear taper pot rather than the standard Log version – this will give you much more accurate control over the tone of your pickups. Potentiometers, in the most basic of terms, are variable resistors – and whilst not strictly true – if you think that when they are resisting at 100% they are letting nothing through, and when they are not resisting anything, they are letting everything through – you know about as much as most people will ever need to. 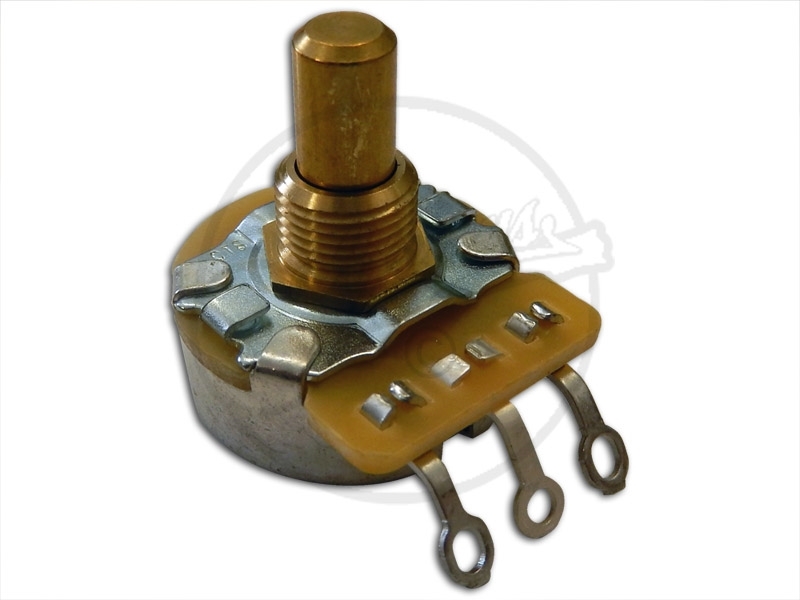 At Axesrus, we try to offer a decent range of the most common resistances for guitar applications, and we’ve worked closely with CTS over the last decade to get the very best from the pots that we carry. As a very quick rule of thumb, its 250ks for single coils and 500ks for anything that’s either noise cancelling or humbucking. Because humbuckers are, in essence, 2 single coils, wired in series, they are normally hotter, so to keep them balanced, need brightening up just a little bit to make them appealing to the ear. What happens when you mix? When you’re running a Humbucker in the same guitar as a Single Coil, you normally will only have access to one master volume unfortunately. This is probably the most important pot in the circuit when it comes to the resistance, so you’ll normally find that it’s a compromise when it comes to which value to pick. Within the industry, you’ll find preference is always given to the Humbucker and a 500k pot will be used, but in home builds and modifications, its completely down to you player. When testing, we’ve found that 250k will suit a single coil perfectly, so it’s ideal for single coils and lipsticks giving that beautiful, chiming, chirpy, soulful twang that you typically associate with single coil guitars. Humbuckers became very “warm” with a lot of the definition lacking in the top end. With a 500k pot, the humbuckers absolutely shined, it was bright, spanky, clear, with a nice definition in the bottom end as well as the top, which gave the impression of a depth in the tone.. Single coils by comparison sounded very shrill, with a very weak bottom end. Not without its charm, but certainly not that USA 50s and 60s rock tone, much closer to the 70s and 80s metal and rock tones.